MANILA, Philippines (AP) — The Philippines’ most active volcano belched out huge lava fragments that rolled about a kilometer (half a mile) down its slope in an ongoing gentle eruption, prompting authorities to evacuate thousands of villagers, officials said Tuesday. The Philippine Institute of Volcanology and Seismology raised the alert level for Mount Mayon, warning that a “hazardous eruption” is possible within weeks. Increased restiveness was recorded overnight, including the ejection of glowing rocks from the summit and dozens of low-frequency volcanic earthquakes. Molten lava has accumulated at the top of the 2,460-meter (8,070-foot) volcano’s crater, creating a glow in the night sky that sparked both awe and fear among spectators. Volcanologist Ed Laguerta said he saw huge glowing lava fragments and super-hot boulders rolling down from Mayon’s crater late Monday, when thick clouds parted and revealed the volcano’s summit. He said the fragments could be seen from as far as 12 kilometers (7 miles) away. Mount Mayon, a popular tourist site known for its near-perfect cone, lies in coconut-producing Albay province, about 340 kilometers (210 miles) southeast of Manila. Albay Gov. Joey Salceda ordered the evacuation of up to 12,000 residents within an 8-kilometer (5-mile) radius of the volcano’s crater. Villagers within 6 kilometers (4 miles) of the volcano, which the government has declared a permanent no-go danger zone, face mandatory evacuation. Disaster-response officials convened an emergency meeting Tuesday to map out steps to avert casualties. 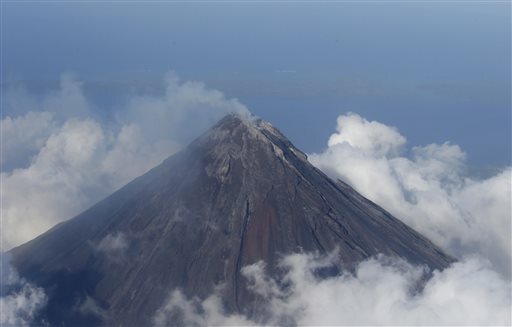 They have been concerned over a brewing storm in the Pacific that might hit the country, including Albay, in a few days, adding possible deadly volcanic mudflows called “lahar” to their worries. “Thousands have been evacuated since last night,” Cedric Daep, a safety officer in Albay, said by phone. The volcano has erupted 50 times in the last 500 years, sometimes violently, endangering thousands of poor villagers who insist on living or farming in the government-declared permanent danger zone.